There is increased consumption of nance fruit due to its versatility, as it can be used as fresh fruit, refreshments and alcoholic beverages, jellies and syrup, and also for preparing ice cream and cakes  . Nance fruits can help improve your eyesight because they are packed full of vitamin E, vitamin C and vitamin A  . Vitamin E guards against unstable molecules, which target the healthy tissues of the eyes. Vitamin C contributes to healthy blood vessels in your eyes and it can combat the development of cataracts. Vitamin A protects the cornea from harmful blue light. The seeds of the nance fruit have been used in the treatment of diabetes, a serious metabolic disorder that affects the retina, kidney and the nervous system. According to the findings of a study, the seed extract of the nance fruit has a positive effect on diabetes. It decreases high blood glucose and lipid levels, increases insulin sensitivity index and regulates antioxidant enzyme activity . 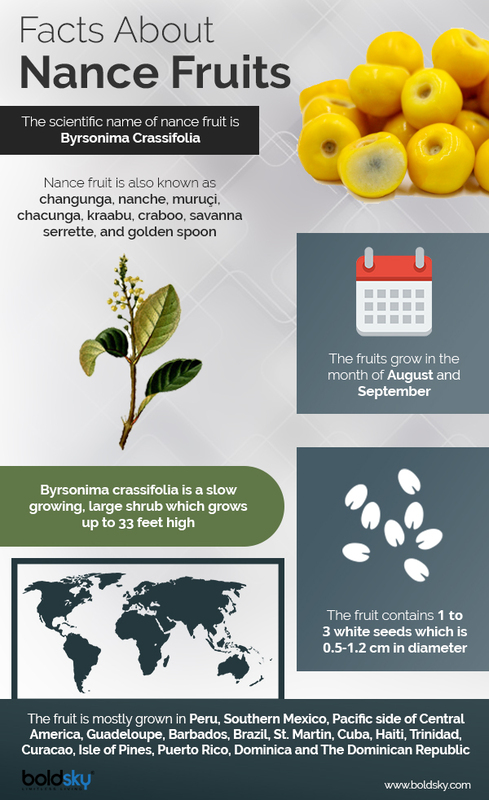 Nance fruits have been used in traditional medicine for the treatment of some mental illnesses. According to a study, the methanolic extract of nance fruit contain flavonoids like quercetin, rutin and hesperidin which are known to have antidepressant effects  . This will help reduce the risk of dementia, depression and other mental diseases. Phenolic compounds, which are natural antioxidants, are present in the nance fruit. These compounds are known to play a preventive role in the development of heart disease  . The fruits also contain vitamin C which keeps your heart healthy by lowering blood cholesterol levels and preventing blood clotting in the heart arteries. Another benefit of nance fruit is that it prevents the development of cancer cells because it contains phenolic compounds. These compounds scavenge free radicals and destroy them and also contribute to the apoptosis of cancer cells  . Consume nance fruits to inhibit the growth of cancer cells. The seed extract of nance fruits has shown positive effects in the treatment of rheumatoid arthritis, thanks to its anti-inflammatory properties. Consumption of these fruits will reduce the inflammation and swelling in the joints and has a much more beneficial effect than non-steroidal anti-inflammatory drugs  . The phenolic compounds in nance fruits can help in the wound healing process and ward off infections. The fruit exhibits antidermatophyte activity that can treat skin infections like dermatophytosis  . In addition, the fruits contain a good amount of vitamin C that aids in boosting the immune system by protecting it from germs that cause internal and external infections. Solar ultraviolet radiation exposure, particularly UVB rays (280-320 nm), can lead to skin lesions, photo-carcinogenesis and ageing of the skin. The high antioxidant activity of nance fruit extract has been shown to protect your skin from the harmful UVB rays  . Medina-Torres, R., Salazar-García, S., & Gómez-Aguilar, J. R. (2004). Fruit quality indices in eight nance [Byrsonima crassifolia (L.) HBK] selections.HortScience,39(5), 1070-1073. Irías-Mata, A., Jiménez, V. M., Steingass, C. B., Schweiggert, R. M., Carle, R., & Esquivel, P. (2018). Carotenoids and xanthophyll esters of yellow and red nance fruits (Byrsonima crassifolia (L.) Kunth) from Costa Rica.Food research international,111, 708-714. Gutierrez, R. M., & Flores, J. M. (2014). Effect of chronic administration of hexane extract of Byrsonima crassifolia seed on B-cell and pancreatic oxidative parameters in streptozotocin-induced diabetic rat.African journal of traditional, complementary, and alternative medicines : AJTCAM,11(2), 231-6. Herrera-Ruiz, M., Zamilpa, A., González-Cortazar, M., Reyes-Chilpa, R., León, E., García, M. P., … & Huerta-Reyes, M. (2011). Antidepressant effect and pharmacological evaluation of standardized extract of flavonoids from Byrsonima crassifolia.Phytomedicine,18(14), 1255-1261. Maldini, M., Montoro, P., & Pizza, C. (2011).Phenolic compounds from Byrsonima crassifolia L. bark: Phytochemical investigation and quantitative analysis by LC-ESI MS/MS. Journal of Pharmaceutical and Biomedical Analysis, 56(1), 1–6. Ramirez, A. M., Cotera, L. B. F., & Gutierrez, R. M. Z. (2013). Anti-inflammatory activity of the hexane extract of byrsonimacrassi folia seeds in experimental animal models.Alter. Ther,19, 26-36. Caceres, A., Lopez, B. R., Giron, M. A., & Logemann, H. (1991).Plants used in guatemala for the treatment of dermatophytic infections. 1. Screening for antimycotic activity of 44 plant extracts. Journal of Ethnopharmacology, 31(3), 263–276. De Souza, R. O., Alves, G. de A. D., Forte, A. L. S. A., Marquele-Oliveira, F., da Silva, D. F., Rogez, H., & Fonseca, M. J. V. (2017).Byrsonima crassifolia extract and fraction prevent UVB-induced oxidative stress in keratinocytes culture and increase antioxidant activity on skin. Industrial Crops and Products, 108, 485–494.